Medical advances are wonderful, but I can't help but wish that the doctors who treat our combat soldiers (past and present) would open their minds to some of the "old ways." The Bach Flower Essence Star of Bethlehem could greatly aid those soldiers suffering from Post Traumatic Stress Disease. Counseling and anti-depressant drugs may help, but until the connection with higher self is reestablished, healing will remain a struggle. 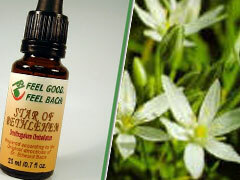 Star of Bethlehem neutralizes any form of "energetic trauma" and restores the body's self-healing mechanisms. This is true for any trauma - large or small - that causes the person to re-live the experience or fear its re-occurrence. It can be used to re-balance after current events - or in treatment many years after the fact. In other words, even our Viet Nam veterans who want to finally be free of their lingering nightmares and fears would do well to combine Star of Bethlehem with their other treatments. And perhaps, if today's returning soldiers were to begin treatment with Bach Flower Remedies upon their return, they wouldn't spend the next 50 years trying to get over their wartime experiences. The Free Offer is Live! Did Bach Flower Essences Cure His Gout?